• Allocate income for selected records to multiple RC revenue center accounts. Evaluate the live software by downloading a free demo from the Price page right now. Simple zip file. Nothing to install. No registration required. Run reports with sample records. Add some of your records. Preserve current deferral balances. Run administrative and other reports. Special type of records? Amortization? Reporting? 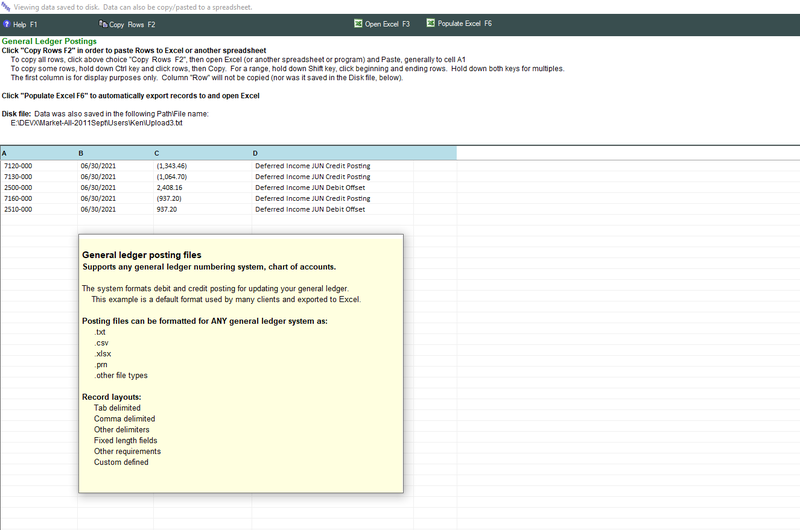 • Sort records by current Deferral Balance. • Records with a 0.00 Deferral Balance will be at the top of the listing. • Select some or all with a Deferral Balance of 0.00. • Select totals by Deferral Accounts. • Old records: Deferral Balance will be as of prior month end. • New records: Deferral Balance will be original Deferral Amount. 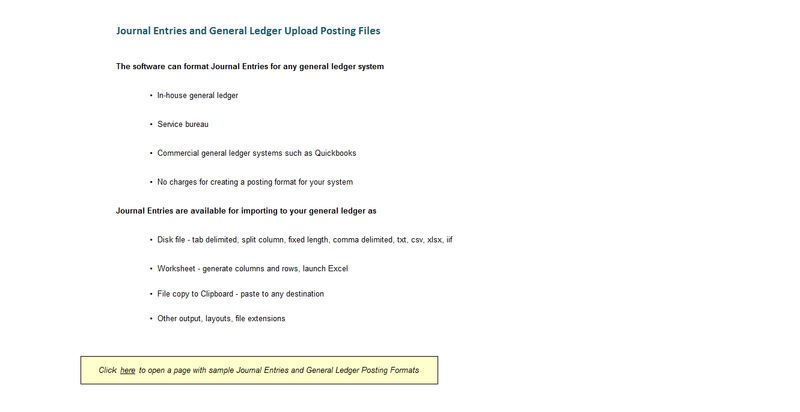 • Each Deferral Account Total on the report should tie to the general ledger. • Obtain Deferral Amount subtotals for each month. • Select all records with a remaining Deferral Balance greater than $5,000.00. • Sort records by Deferral Account account. • Obtain Deferral Balance subtotals for each Deferral Account number. Example: Create a report containing records with a Remaining Term greater than, say, 12 months. Determine Long Term classification balances. Calculate income and balances for a month or multiple months. Export to Excel for internal/external purposes. • If desired, the system can distribute amortized income for selected records to multiple revenue center accounts. • This report provides a detailed listing as to exactly how income for each record was distributed. • Amortized income, deferral balances and totals. Any month. Any year. Any period. • Calculate income amortization and balances for multiple months, an entire year. Display monthly income in a single column or multiple, month by month columns. Preserve existing deferral balance book values. Calculate prior and current deferral balance book values. 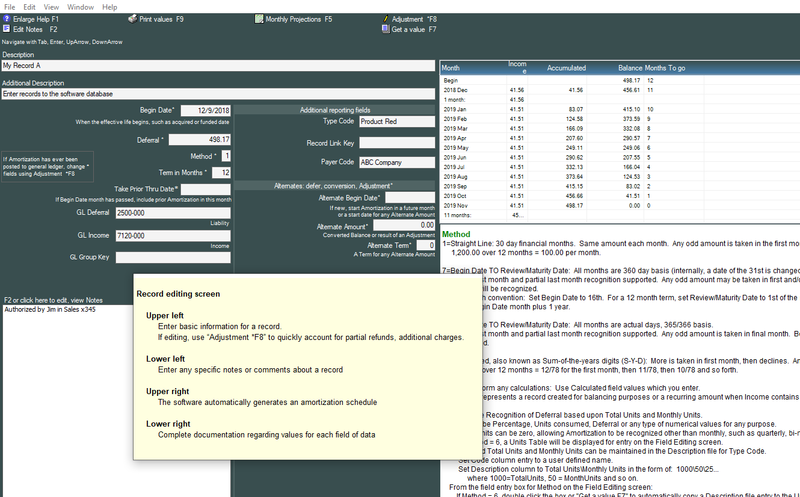 The software can amortize deferred income from original dates. "Thanks for your help today. We imported all of our records and current balances without a problem. 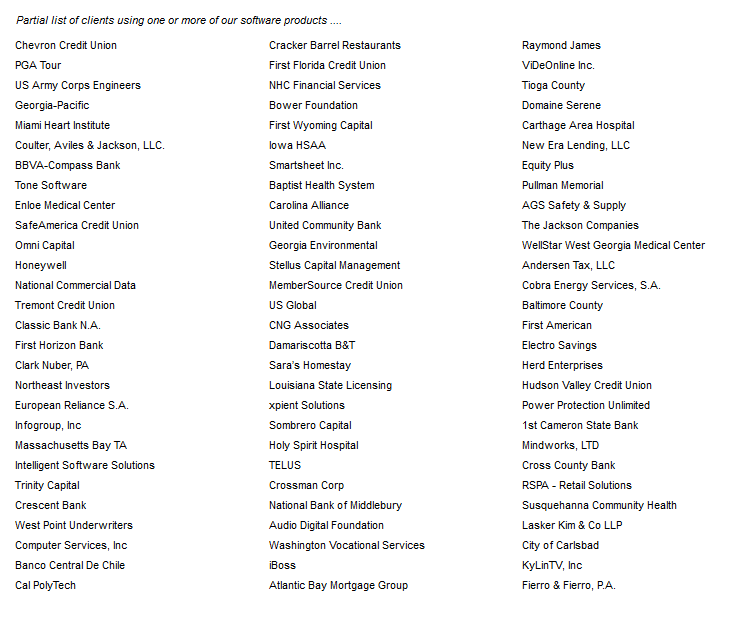 Your software is as advertised and will be most useful." Branch, department, revenue center count wherein each receives the same income portion. Create a single record for an income to be distributed among branches. If 5 branches, each receives 1/5 of monthly amortized income. Participating branch, department, revenue centers wherein only some receive a portion. Workstation count, allowing IT incomes to be allocated based upon assigned equipment. • A branch, department or revenue center can be located anywhere within your account number. • Assign an allocation method within the income account number at the record level. • The software replaces a method with as many branch, department, revenue centers assigned to the method. Current accumulated and balance for existing records can be preserved or calculated by the system. Report all records that will have a zero balance as of December 31st. Report all new records for the previous quarter with deferred income > $1,000.00. 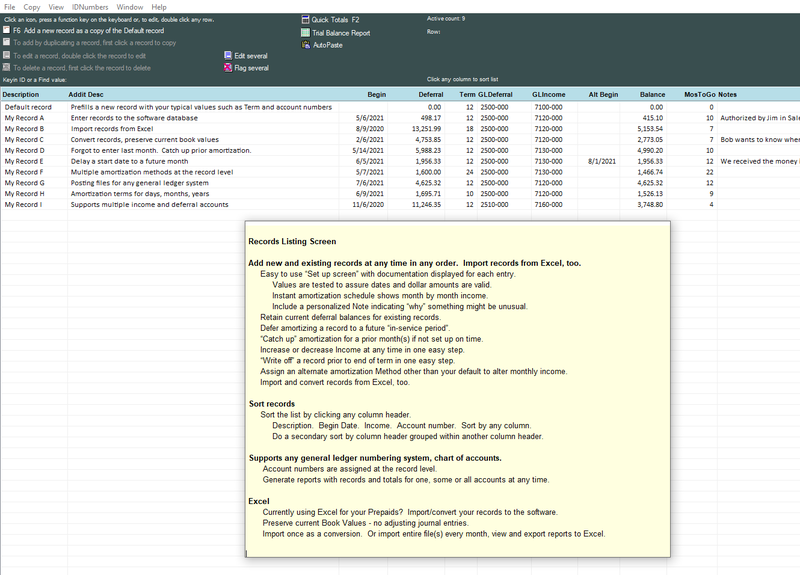 Report all records in three income accounts, send report to Excel. Monthly amortized income for a record can be distributed to multiple income accounts. Prior month income for a record can be included with the current month. Add a record that shouldn't begin amortizing right away? Allocate income to several branches or departments? The Allocation module distributes income using one or more methods. Recall prior monthly general ledger income and offset account postings. Reconcile your deferred income liability accounts. In seconds! 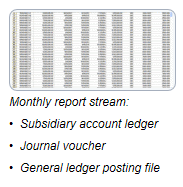 Simply compare the Reconciliation Report to your general ledger liability account activity. Reconcile an entire year - great when auditors want to see annual changes to your deferred income liability accounts. Preserve current Balance and Accumulated. Sent from their Accounts Receivable (A/R) department. Generally, monthly amortization is posted directly to a general ledger income account. Branch, department, RC, revenue center accounts. - Same percentage to each center (evenly). - Merely substitute the revenue center portion of a general ledger account number with a Method. Revenue center identifiers can be of any length. 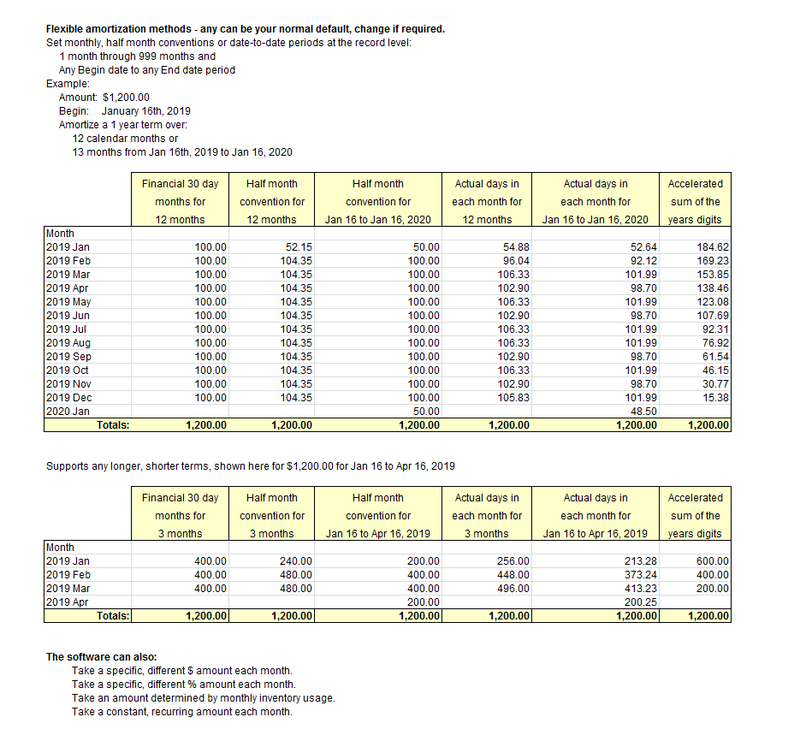 Span fiscal year - display general ledger annual income for each month.